Academic rigor is the heart of career preparation. Your NCLEX exam training starts day one and builds with each term preparing you for licensure and a career. The Associate of Science in Nursing program at Stanbridge University prepares you to enter a fast-paced profession, confident to think critically, solve problems, and ultimately, heal those in need. Our program builds on your talents to define you not just as a licensed professional but also as a leader, ready to take on challenges and dedicate your life to saving others. 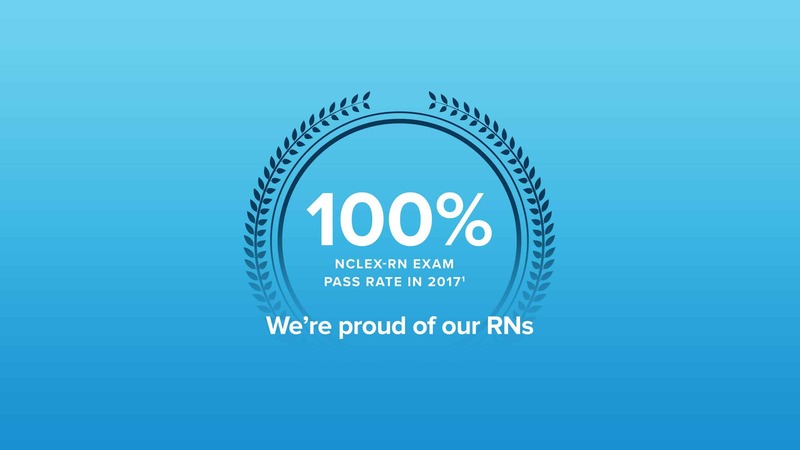 With a 100% NCLEX-RN exam pass rate in 2017/2018,1 we’re committed to your licensure preparation. Throughout each term and after graduation, you’ll get practice tests, online mentorship, subject-specific reviews, and assessments to help your preparation. Hands-on training in our world-class Simulation Lab helps you improve confidence to care for patients in a fast-paced environment. This lab features high-fidelity simulation manikins with pre-programmed patient scenarios including cardiac arrest, stroke, and birth. These breathing, talking, and crying manikins help test your skills and response time to critical conditions. You’ll review your actions and the patient’s real-time physiological responses with your instructors via video recorded simulations to help you focus on areas of improvement. Three Nursing Skills Labs emulate the real-world of patient care with 26 hospital beds, mobile electronic medical records charting carts, and patient manikins. In these labs, you’ll apply concepts and procedures to real-life scenarios in a safe and supervised environment. The Human Cadaver Lab houses both real and synthetic human cadavers giving you an in-depth and tactile understanding of human anatomy. As the first cadaver lab on the West Coast to feature full-body synthetic human cadavers, you can get hands-on training with life-like body systems, bones, muscles, and organs. Each classroom operates with a SMART Board, laptop workstations, and digital exams with instant score results. Access to online PowerPoint presentations with note-saving availability, instant student polling, and the digital Learning Resource System heightens the academic experience. Join a collaborative, active, and engaging group of fellow nursing students and work together to serve local community needs and raise awareness of healthcare. Nursing students get an in-depth look at human anatomy and body systems on a synthetic human cadaver in the Human Cadaver Lab on campus. Nursing students learn in the Virtual Reality Lab with the Anatomage Table, a virtual dissection table for human anatomy education. Student nurses practice their CPR skills on simulation manikins inside the on-campus Simulation Lab. Student nurses celebrate their academic achievement and first steps toward professional careers at the Nursing Pinning Ceremony. Student nurses receive hands-on practice in patient care inside of one of the three Nursing Skills Labs on campus. Nursing students delve into human anatomy in the Anatomy and Physiology Lab dissecting spinal cords. Students celebrate their academic achievement with their loved ones and program faculty at their pinning ceremony. Three Nursing Skills Labs give our students the ability to practice valuable skills with 26 hospital beds, simulation manikins, EMR carts, and professional nursing supplies. The Stanbridge University Nursing Students’ Association (SCNSA) executive board leads fellow students in working together to promote OT and OTA to their community while hosting networking and service events. Students learn from their actions as they review recorded footage of their performance in simulated patient care scenarios on SMART Board technology in the labs. The Stanbridge Nursing Simulation Lab houses high-fidelity human birthing simulation mother and infant manikins, for students to practice their labor and delivery skills. The Nursing Simulation Lab includes seven high-fidelity simulation manikins and EMR carts to teach students proper patient care skills. Similar to programs around the country, the ADN (RN) program's theory, lab, and clinical activities may be scheduled at varying times due to the nature of clinical site partnerships and schedules. Students will attend classes for 3 or 4 days a week; 1 to 2 days shall be theory and 1 to 2 days shall be clinical. Theory classes are scheduled between the hours of 8:00 am to 10:00 pm and lab/clinical for 8 or 12-hour shifts. Clinical sessions may be scheduled on the day, evening or night shift and on weekdays or weekends. Students will be notified of the class schedule two weeks prior to class start date. Created by the National Council of State Boards of Nursing (NCSBN), the National Council Licensure Examination for Registered Nurses (NCLEX - RN) is required for all nursing students to pass in order to become a Registered Nurse in the United States. The examination upholds a strict level of competency and critical thinking in a series of four categories including safe and effective care environment, health promotion and maintenance, psychosocial integrity, and physiological integrity. Preparing for the NCLEX-RN is critical to your success as a student and professional. With a 100% NCLEX-RN exam pass rate in 2017/2018,1 Stanbridge University strives to ensure that you are fully prepared to take the NCLEX-RN examination. The Associate of Science in Nursing program weaves NCLEX-RN exam preparation within its curriculum, clinical practice and overall instruction. Practice tests, practice questions, and one-on-one instructor guidance give you a comprehensive review throughout your program, after graduation, and right up until you take the test. Ready to begin the Associate of Science in Nursing? We're excited to help you get off to a great start on your educational path. 1. Complete an online application for the Associate of Science in Nursing degree program. Click here to apply now and start your admissions application process for an early decision. If you are not ready to apply, but would like more information, please attend an information session and campus tour offered on campus. Click here to view the info session schedule. Please note, all prospective students must apply online before moving on to the entrance exam step. 2. After submitting your online application, take the Accuplacer examination and achieve the following preferred minimum scores on each test of this examination: Reading Comprehension 240; Sentence Skills 234; Arithmetic 226; and Elementary Algebra 206. Scheduling your exam will be coordinated by your dedicated Admissions Representative. 3. Take the ATI Critical Thinking Assessment Entrance Exam and achieve a preferred minimum score of 68% to be eligible for an interview. 4. Submit an official transcript of record showing possession of a high school diploma or its equivalent, such as a (GED), from an accredited secondary school or an associate degree or higher from an accredited college or university. 5. Take the Online Readiness Quiz. Click here to start. 6. Complete a background check. 7. Schedule and attend a meeting with a Financial Aid Officer. 8. Submit Official Transcripts of all courses taken at all high schools, colleges, and/or universities. 9. Participate in two interviews with the Program Director or designee(s); write a timed essay; and take an impromptu math quiz on dosage calculation. The thirty (30) applicants who have met the minimum requirements for admission to the ADN program, and who have the highest number of combined points awarded according to the departmental rubric, will be accepted for admission to the current cohort. Should an opening occur, the applicant who has the next highest number of combined points may be accepted for admission. If there are more than thirty (30) individuals qualified for admission to a given cohort, those who are not admitted to the current cohort may reapply to be considered for admission to a subsequent cohort. The course is equivalent to one required in the ADN program. Required prerequisite science courses must have been completed within two (2) years of the date of enrollment. Prerequisite English and math courses must be completed prior to the date of enrollment. Nursing courses must have been completed within three (3) years of the date of enrollment. The grade in a prerequisite course in science (Human Anatomy, Physiology, General Microbiology) is 3.0 or higher; in another prerequisite course (English Composition, College Algebra I) or general education course (Introduction to Sociology, Developmental Psychology, Speech Communication) is 2.0 or higher; or in an RN nursing course is 3.0 or higher. An applicant may receive competency-based credit for an RN nursing course by passing a written examination on the theory objectives and a skills demonstration on the clinical objectives of the course. The Program Director will administer this process. 11. File all required documents with Admissions at least two (2) calendar weeks prior to the interview with the Program Director or designate and ensure all required proof of physical examination, immunizations, and valid CPR card is submitted to Admissions seven (7) days prior to the start of orientation. 12. Applicants will be notified of admission to the program by a letter of invitation. An applicant may only decline the letter of invitation twice and must repeat steps 2-10 above if he or she reapplies for admission to the program. 13. Applicants who are not admitted to the ADN program may reapply for admission by repeating steps 2-10. 14. Applicants reapplying for admission only have to resubmit official transcripts of record if they have taken additional courses since the previous application for admission. The University Student Catalog shall include a section referring to Awarding of Credit for Previous Education or Competency-Based Credit, Including Military Education and Experience for all students, including those that have served or are serving in the United States Armed Forces. The University Associate of Science in Nursing webpage shall provide a link identified as “Transfer Credit for Military Experience” that directs to the policy. A form outlining the procedures will be provided and kept as a record in the student’s file. The student’s file will reflect the awarding of credit on the student transcript. For more information on this policy, please read page 15 of the current Stanbridge University catalog. Ready to earn your Associate’s Degree in Nursing? 1 Source: The California Board of Registered Nursing; http://www.rn.ca.gov/education/passrates.shtml. As viewed on April 5, 2018. 2 Source: Registerednursing.org, 2019 Best RN Programs in California. Data sourced from NCLEX-RN exam pass rates for the state; https://www.registerednursing.org/state/california/. As viewed on February 7, 2019. 3 Program duration subject to change. 4 Program schedule subject to change.